During the Samhain holiday season, I often like to reflect on some of the core mythology that is centered around this time in Irish mythology and lore. The Morrígan- or the Great Queen as her name means and we often refer to her as- is known primarily as the ancient Irish goddess of battle, warriors, and sovereignty. Of the former, many people tend to shy away from her, fearing that honoring or worshipping a deity of war is in some way equivalent to cheering for and advocating for war in a general sense. I assure you that it is not, particularly in her case, and I will get to that further down in this blog. Of the later aspect -sovereignty- most people would probably associate with positively, but may not have a full understanding of what it is. Some people’s explanations may be more on the mark than others, though many of them would be at least partly correct as it is a multi-faceted and complex issue that is not summed up by simply one answer. This is my answer- at least in it’s current understanding. While I have been involved with indigenous struggles for sovereignty for a number of years prior to my involvement with the Coru Cathubodua, the context through which I have come to understand it is now heavily flavored by my work therein, and of course with Herself. 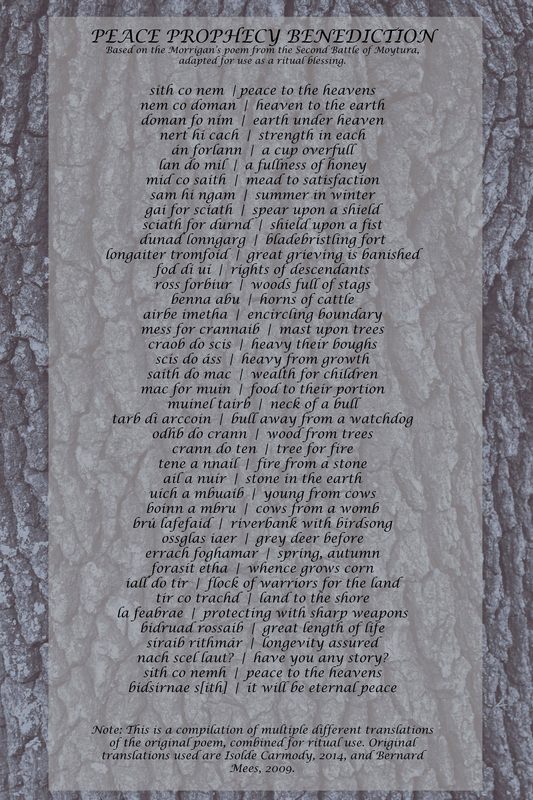 With that in mind, I will be drawing on certain passages that come from poems in Irish mythology ascribed as prophetic battle poetry that the Morrígan spoke during the Second Battle of Moytura- a battle centered around freedom, justice, and the right to rule. 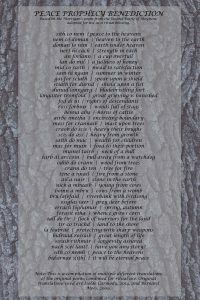 These poems were given in the context of inciting the Tuatha De Danann into greater courage during the battle, and prophesized of two possible futures of either victory or defeat for their people. True to the timeless nature of any authentic prophetic telling, they both contain elements that we might find relevant to myriad struggles we face today. They also give a glimpse into the notion of sovereignty and honor that were so central to Celtic cultures. The first poem is perhaps the hardest to digest as it is the bloodiest, explicitly describing scenes typical of an Iron Age battle. The first line however is notable in that the Morrígan calls “Kings arise to the battle.” I see this as a significant implication here of individual sovereignty of each warrior she’s inciting in this context. She is not just calling to Lugh (who has just slain the giant Balor), or Nuada who’s arm was severed, but to all the Tuatha De who were said to be fighting in this battle. The concept of kingship here however should be understood in it’s cultural context, rather than the particularly bad medieval examples we might be more familiar with. Kingship in an ancient Celtic context was deeply tied to honor and sacrifice. Celtic kings were answerable to their people- often times elected in a tribal ritualistic manner rather than inherited- and held a particularly sacredotal role with regards to the people’s relationship to the land. This notion of individual sovereignty is one that people today are probably more familiar with and probably gravitate towards. Particularly in America, there is a strong culture of independence and personal freedom that gets construed with sovereignty. And certainly, this aspect of it is to be honored. Every individual deserves the right to choose their own path regarding their body, their beliefs, their direction in life, and who they choose to love. I would also argue that individual sovereignty also has a more inside component, where we are truly in control of our own minds- or our True Will to borrow a Thelemic term- as opposed to buffeted around by subliminal cultural programming, addiction, physical and psychic parasites, and our own neurosis’s. True personal sovereignty is freedom from both outside oppression, and inside oppression- much of which is actually an invasion of our being from an outside force. But our independence should not be taken so far as to exclude the reality of interdependence as well. There is also a degree to which we must be answerable to our communities in order to uphold a peaceful and prosperous society for everyone. It may be cliche, but everybody does better when everybody does better. The commons is a social benefit which any just society holds dear, as there are such basic things such as physical/psychic safety, clean water and air, access to nutritious food, and appropriate healthcare which all people need in order to live and thrive. Upholding these common rights and values however requires a certain relinquishing of personal freedom at times. When one person or group of people’s freedom becomes oppressive of another individual or group, it ceases to be sovereignty and is strictly speaking abuse and/or tyranny. This could and should also be applied to our relationship with the Earth- as sovereignty was among Celtic societies. In the second poem, the Morrígan presents a balanced vision of the world, one that is at peace but nevertheless needs warriors to defend it. The poem opens with “Peace to the heaven, heaven to the earth, earth beneath heaven.” These three lines effectively establish that all is right with the world, and that peace exists in a balanced relationship between the above and the below. The cosmology is in good order. Immediately following this statement is “strength in everyone, a cup overfull, a fullness of honey”, again implying that such peace exists when each individual is free, fortified, and abundant. This isn’t the kind of faux-peace like Pax Romana- or Pax Americana- where only the upper classes had/have abundance while everyone else had/have taxes and debt, this is about everyone prospering. Such prosperity however was in part the duty of the sovereign. In Celtic myths, a feature that we often find is the king at some point becomes wedded to the goddess of the land who in turn ultimately bestows the power to rule. His or her fitness to lead is established through their honor, integrity, and ability to establish security and stability, not just in the present time, but for future generations as well. “Rights of descendants” and “Wealth for a boy” are two lines which establish that this is a multi-generational vision. The land is also to be prosperous unto itself as “Woods full of stags, encircling boundary, mast heavy trees, heavy their boughs, heavy from growth” and “Salmon their victory” imply that the land is not just an empty resource for the people, but has it’s own kind of sovereignty. This sense of deriving right rulership from the land was lost long ago under patriarchal, Christian monarchies who derived their power from an angry, jealous god who had no relationship to the land whatsoever. Since throwing off the yoke of inherited kingships through establishing modern democracies, we’ve begun to approach the concept of rule by the people, and through them in a way- the land. But there is still much work to be done on this front, particularly now since American democracy is in a dangerous downward spiral, and authoritarian, fascistic regimes seem to be coming back into fashion worldwide. It is just such a world we live in now. What is clear to me however, is that both worlds co-exist, eternally struggling with each other as we humans bumble our way toward whatever fate is ours. Whether the Dark Prophesy will entirely consume us to our end, or we can reestablish sovereignty and right relationship with the land and each other is yet to be seen. The key to cultivating more of the Peace Prophesy is sovereignty- personal sovereignty, collective sovereignty, and sovereignty of the land. But it should not be forgot, as the Peace Prophesy reminds us, that such sovereignty is not freely granted and must be continually fought for and protected. May you be strong in your fight, and the “helpful raven” aid you in whatever way is best.